Well besides the onesies I made yesterday and btw I made 5 more for another baby. 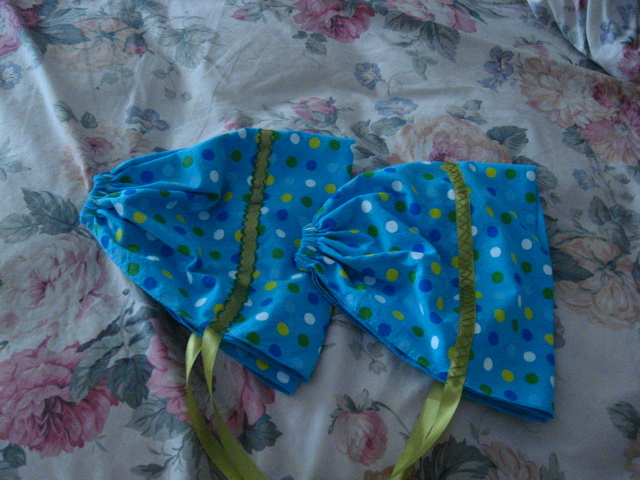 I did 2 Old Navy shirts for my friend Sakina’s daughters Hana and Noora, and today I made them bonnets. Sakina and I have this thing going on where we are kinda making something everyday out of stuff we have just around the house. It has been a plast so far. Today I made sunbonnets out of bandanas that Sahara picked up at the dollar spot in Target. We post the day’s project on our repsective blogs by midnight and begin thinking of the next days project. Todays bonnets came from the desire to make the cutest bonnet ever that I saw on the Angry Chicken blog. So Katie I am currently sewing in our desire for peace and thus far it has given me peace, so I feel good about it. Not much knitting going on. I am frustrated with the “wool” at the moment. Anyway I digress, I had been blog surfing and came across The Angry Chicken’s Blog, where to my wonder I beheld the most fantastic idea ever, and just filed it away for something to do in the future when all the pregnant women in my world gave birth.